If April showers bring May flowers we will be delighted, particularly after the storms wrought such havoc. The weekend storms were unlike any in recent memory with torrents of rain for days, sustained winds that ripped and tore foliage, uprooted trees, produced mini-tornados, and did substantial damage. These storms have an intensity that is frightening and seem to increase in velocity as they travel across the country. It is fortunate it is so early in the season because Nature will repair the damage to the trees and shrubs. However there is no such luck for the Peonies that were in full and glorious bloom… the wind and rain shortened their show and it will not return until next spring. The up side is the late blooming Iris are putting on new buds and Oklahoma has finally emerged from our drought status. In checking the garden, I noted the deluge did not deter the hoards of bugs invading the garden. The most invasive so far seems to be the blister bug seen scurrying among almost all the garden vegetation. Blister bugs belong to a group of insects who have met on a collision course with mankind for many years and are considered ‘very bad bugs‘. 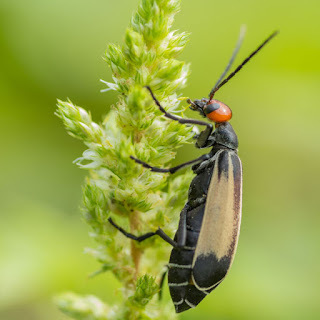 They travel in packs and migrate to whatever seems delicious at the moment, and unlike some insects that have a favorite flavor the blister bug eats everything indiscriminately. Thus just as the produce and flowers reach their peak, they arrive enmass and strip the plants of all protective foliage practically overnight. A clever insect, they have been known to drop to the ground and ‘play dead’ when disturbed. When that tactic fails, they release their infamous caustic toxin Cantharidin, and it is from this they get their reputation as ‘blister bugs‘. If crushed, the beetle literally bleeds this chemical from its joints and any skin contact with this goo results in painful blisters. Blister bugs love alfalfa flowers and have often been accidentally ground up during harvest resulting in Cantharidin infected hay. When consumed by livestock the resulting blisters may cause illness so this beetle is quite dangerous. To rid the garden of them I recommend shaking the branch and stepping on them with hard sole shoes and since they will have squished, do not touch the soles and leave your shoes outside… high and away from children or pets.